Once the GMO salmon hits supermarkets, we won’t be able to tell apart Frankenfish and real salmon, so there won’t be a way to avoid it! 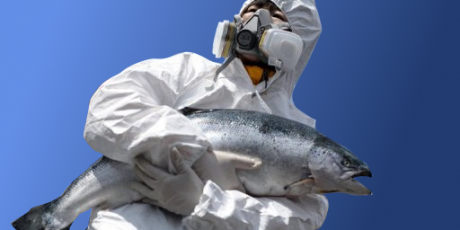 The US is about to treat the world to the first genetically modified meat: a mutant salmon that could wipe out wild salmon populations and threaten human health — but we can stop it now before our plates are filled with suspicious Frankenfish. The new fake salmon grows twice as fast as the real one, and not even scientists know its long-term health effects. Yet it’s about to be declared safe for us to eat, based on studies paid for by the company that created the GMO creature! Luckily, the US is legally required to consider public opinion before deciding. A growing coalition of consumers, environmentalists, and fishermen is calling on the government to trash this fishy deal. Let’s urgently build an avalanche of global support to help them win. The company that developed the Frankenfish altered the DNA of the salmon to create a fish that would grow at lightning speed, year-round. Not only do we not understand its long term health effects, if a few of them or their eggs reached the wild, these super-salmon could decimate entire wild salmon populations. Worse, once they hit supermarkets, we won’t be able to tell apart Frankenfish and real salmon, so there won’t be a way to avoid it! The biotech industry has spent hundreds of millions of dollars lobbying governments to approve its GM crops. Frankenfish is their next million dollar baby — it could open the floodgates for other transgenic meats. But the US government will consider public opinion before it makes its final decision — if we can stun them with a giant global opposition when they least expect it, we can stop this reckless deal. Avaaz members have come together to protect the natural world and our food system from dangerous meddling. In 2010, over 1 million of us spoke out against genetically modified food in Europe. Let’s come together again to stop Frankenfish.